I have been told (sometimes in disapproval, other times in admiration) that it is unusual that I am so comfortable doing things alone – attending operas and concerts, going to museums and lectures, taking myself out to a fancy restaurant, etc. I do not find it unusual, per se – in fact, I enjoy the opportunity to be alone with my own thoughts – but these comments have made me aware of my behavior while alone. I probably take so many photographs because of this. Photographs remind me of the things I have done and the things I have seen – precisely because there is no other human being who can remind me. A challenging aspect about having so many experiences alone is that I have to rely on my own ability to draw conclusions and make comparisons – instead of collaborating with someone else. This happened in Germany, as I found myself inexplicably and evermore disinterested at Holocaust museums. It was very late in my stay in the country that I suddenly came to the realization that all of these museums basically had the same photographs; the same facts; similar artifacts – with slight variations depending on the venue. If you were to ask a relatively well-read person about the Rwandan genocide, this person would likely come up with a narrative something like this: “In 1994, the majority Hutus of Rwanda started indiscriminately massacring the minority Tutsis with machetes.” If we start analyzing this narrative, we get some very interesting insights. First, there is a clear-and-simple conflict: one ethnicity was being murdered by the other. In this, there is no room for exceptions – nor is there a place for the political and military narrative leading up to the 1994 genocide. Second, the conflict becomes simplified to being a spontaneous and barbaric tribal war because of the emphasis on machetes. This conveniently fits with the western misperception of an archaic Africa, which means that foreign governments and companies are not compelled to take responsibility for weaponry or military aid. Needless to say, the narrative of the Rwandan genocide has been simplified. In some ways, this is good – everyone knows that a simple story is more likely to be shared than a complex one. However, in other ways, this is negative – as the citizens of the world are not forced to put blame where blame is due. 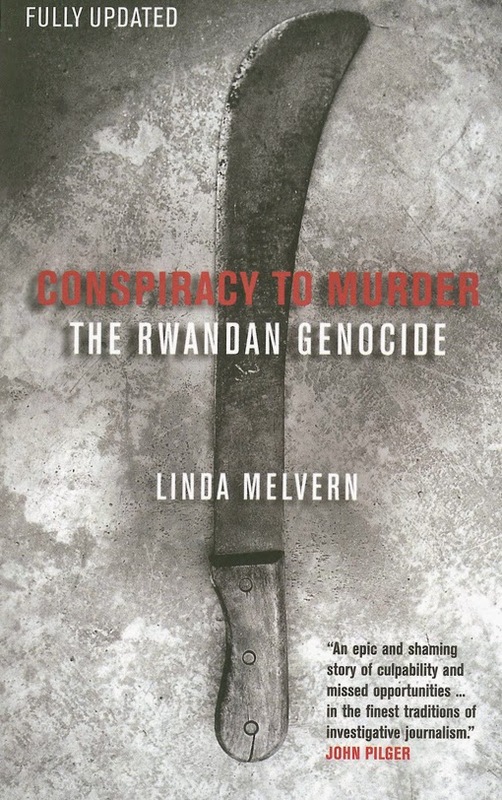 It is with this in mind that I purchased Linda Melvern’s “Conspiracy to Murder: The Rwandan Genocide,” published in 2004 by Verso. As one can easily see, the title alone sets aside the simplistic narrative of spontaneous mass ethnic massacre and cuts straight to the heart of the matter: that the Rwandan genocide was planned and carefully executed by a select group of leaders, as a Hutu regime was afraid of its uncertain future. Even before the founding of Rwanda in 1961, ethnic strife ran rife. As the author explained, “In 1959 thousands of people were killed and thousands more families fled when Belgian authorities proceeded to oust Tutsi chiefs and sub-chiefs and replace them with Hutu… The UN General Assembly sent a special commission to Rwanda. It reported that racism bordered on ‘Nazism against the Tutsi minorities’ and that the government together with the Belgian authorities were to blame.” (page 7) Conflict continued under the first elected (and Hutu) President Grégoire Kayibanda, however escalated after 200,000 Hutus were slaughtered in Burundi in 1972 with support of the ethnic Tutsi government. It was at this point that the defense minister Juvénal Habyarimana took power by force in 1973. Although he made Rwanda into a one-party state, in the early years of his regime, Rwanda experienced more economic prosperity and less ethnic conflict. All of this was beginning to change in the late 1980s and early 1990s. First of all, a new pro-democracy movement was growing – splintering the Hutus between different visions of the future: a future with strongman Habyarimana as its leader and a future with more political parties and opportunities. Perhaps even more threatening to the regime, in 1990, the Rwandan Patriotic Front (RPF) guerilla army invaded from Uganda. The RPF was made up of predominantly ethnic Tutsis whose families had left the country during the massacres of the 50s, 60s, and 70s and were raised outside of the country. “The RPF invasion was a failure, largely because both France and Zaire [the Democratic Republic of the Congo] sent in forces to protect their ally.” (page 14) As one might imagine, this was a huge problem for the democratic movement – further splintering the political parties between those who were willing to negotiate with the RPF and those who were not. Simultaneously, those in the old regime were preparing themselves for something much different than a power-sharing agreement. Following the RPF invasion of 1990, they began to prepare for a seemingly-spontaneous mass murder through a so-called “civilian self-defense system.” Equally telling was that “In the three years from October 1990 Rwanda, one of the poorest countries in the world, became the third largest importer of weapons in Africa, spending an estimated US $100 million.” (pages 56-7) An astute observer of Rwanda might have also recognized the dramatic increase of machetes and agricultural tools coming from China, worth some $4.6 million.